The New York Times reports that Barack Obama, during a meeting with Democratic governors in Chicago, sat behind a previously unseen and very official-looking seal bearing his name. 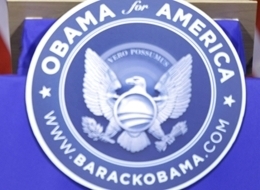 Featuring an eagle clutching an olive branch, the seal resembles that of the President of the United States. Above the eagle's head is the phrase, "Vero Possumus," which the Times translates as being roughly equivalent to "Yes We Can."